I was quite curious about the journeys of Mary’s objects. Sharon asked me to research ‘five Roman bronze needles found in Lincoln by James Smith of Whitechaple’ mentioned in a list of things sent to Manchester in April 1926. I couldn’t find these in the collection and had assumed they were deaccessioned or disposed of. However in my recent correspondance with Liverpool museums, the note written in 1929 by the Deputy Chief Librarian, ‘Donations by Mrs. M. Greg and Miss Hope’ mentions ‘Roman pins found in London’ I believe these could be the same objects. As there may have been some mistake between Lincoln and London and the man who found them lived in Whitechaple. (I have assumed this to be London as there are no places near Lincoln with the same name.) Although the Roman needles were given to Liverpool they did not keep them as they are not on the list of items in their stores today. This made me curious as to whether the needles were moved on or disposed of, so I decided to look at a few museum databases and search their collections. The British Museum has 108 results for Roman bronze needles and many of them have no further information other than an acquisition number. An unfortunate dead end perhaps. I typed in Mary Greg to their database anyway to see what I would find… I was pleasantly surprised to find some different objects! Another item Sharon asked me to research were ‘lead badges found in Tortosa’ that were mentioned in a letter dated 26 October 1924. they were sent to the Fitzwilliam in Cambridge. When I contacted the museum they told me they did have a variety of objects donated by Mrs Greg but not the ones I enquired about. 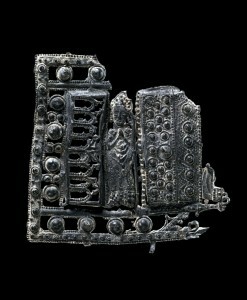 On the British Museum’s database I found that Mary had donated a number of lead pilgrim badges. Although these could not have been the ones mentioned in her letter as these were accessioned in 1921. They are perhaps similar. The lead badges mentioned in 1924 were found in Tortosa. This was a place involved in the Crusades in Syria – today it is called Tartus. In 1123 the crusaders built a church there called Our Lady of Tortosa which was known for its pilgrims. I think these could be linked. It is an interesting notion of journeys and pilgrimmages that these objects emit. I think that Mary herself went on journeys with the objects. She met so many interesting people because of them and had contacts in all parts of the country. Her letters are a document of the emotional journeys she went on as well as the physical ones of her objects. I have so many things to put on the blog that I’ve found; its been a busy week! But I will try and get everything on today. Anyway, a few weeks ago Sharon mentioned that Mary sent some objects to Timaru, New Zealand. Unfortunately the letters don’t specify where in Timaru so I emailed their local museum, South Canterbury Museum to see if they had ever heard of Mary. My first response was that nothing came up in the database under the name Mary Greg. As the museum was set up in the 1940’s I thought it might be too late for Mary’s objects anyway. However, I received an email this morning telling me that museum staff believe Mary was a donor to the Hope Collection! Which was donated to the museum in 1954. It belonged to Arthur Hope, Mary’s brother; who moved to New Zealand in 1878. He was a farmer in South Canterbury. The collection has over 200 items. Lots of textiles and other artefacts, including a framed embroidered picture worked in wool, by Mary Hope and Mrs. T. Greg. The collection was exhibited in 2006 and my contact, Davina Davies researched the objects as much as possible but could not find out anything about Mary Greg because she had assumed she had lived in New Zealand. Davina mentions that some of the objects are rare and unusual and many are in poor condition. I have asked for a catalogue of the exhibition and a picture of Mary’s embroidered picture.